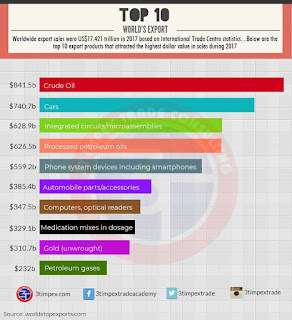 It is interesting to note that crude oil was the most traded product in the year 2017. It overtook vehicles which was the most traded item in 2016. I hope this will not deceive the crude oil exporters (especially the African countries) into thinking that the plan of many countries in the world to switch over to environmental friendly cars (and other machines that do not use fossil fuels) is not going to be a reality very soon. 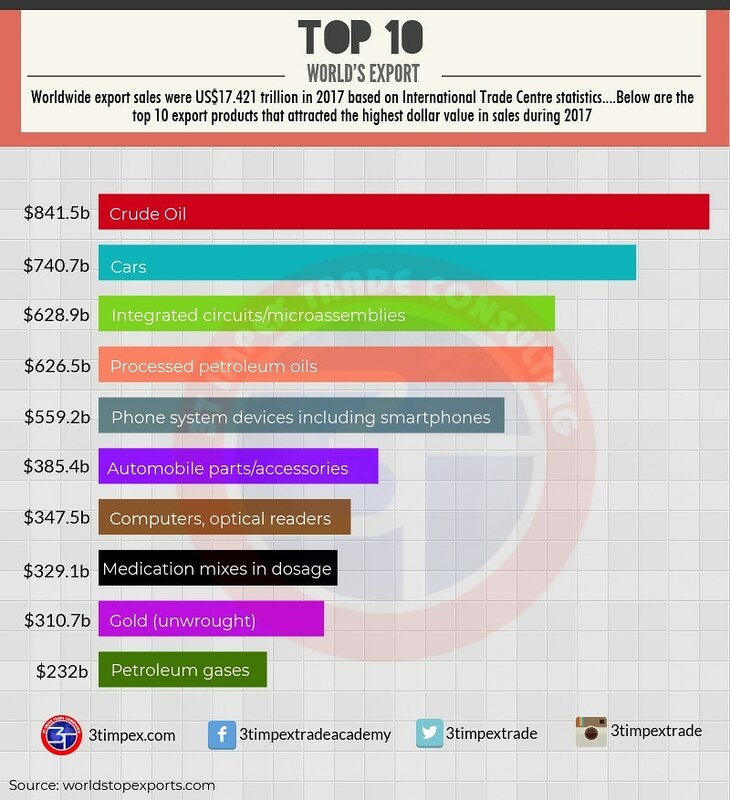 Apart from crude and gold, almost all other products on this list are complex products with very high demands from many buyers in almost every countries all over the world and not commodity with demand in very few countries and from few buyers. Africa needs to wake up, from basking in the euphoria of growth in Agricultural products and export, to the reality of aggressively pursuing the production of complex products through signing bilateral investment agreements with countries that have the technology and willing to come and set such factories on African soil. However, the objective of such agreements should be build, operate and transfer to local investors that have contributed equity to the establishment of such companies. Such agreements should also incorporate clauses entrenching the principles of fair and equitable treatments so as to ensure that the investor are comfortable to come in with their investment knowing fully well that their assets are secured. 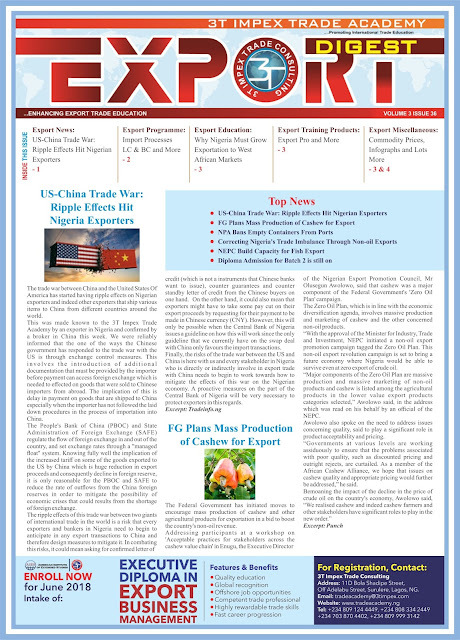 It is high time African leaders stop this mediocre thinking by only focussing on commodity export which is of very low value and begin to work towards contributing significantly to global trade by producing and trading in complex products like cars, mobile phones, integrated circuits act. Are you interested in Export Business but too busy to attend training programmes? 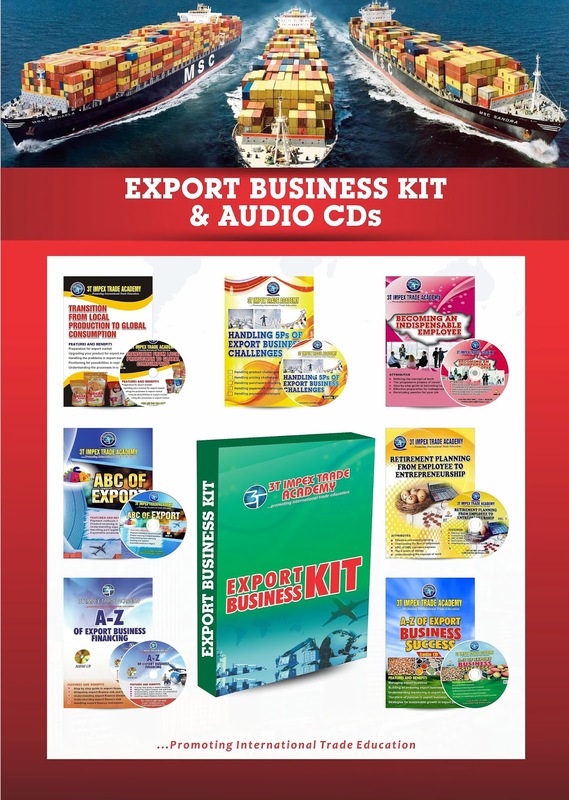 Then get Export Business Kit from 3T Impex Trade Academy. It contains 10CDs and 3DVDs and a Book. 7. Export Business Made Easy (1 Book). It costs N50,000 and it can be delivered to you anywhere in Nigeria and no extra cost. Impex Trade Academy in conjunction with the American Institute of Extended Studies has commenced Certified Trade Professional Development Programme in Nigeria (TPDP). This program is the first of its kind and it seeks to promote international trade education in Nigeria and Africa in general. This is programme has been designed in form of a continuous education programme to enable young and old professionals to sharpen their skills and grow their careers. Some of the features of these training programmes include; flexibility, affordable tuitions, high quality education, reliability, courses authenticated by an institution accredited by the US government and increased potential for career advancement. 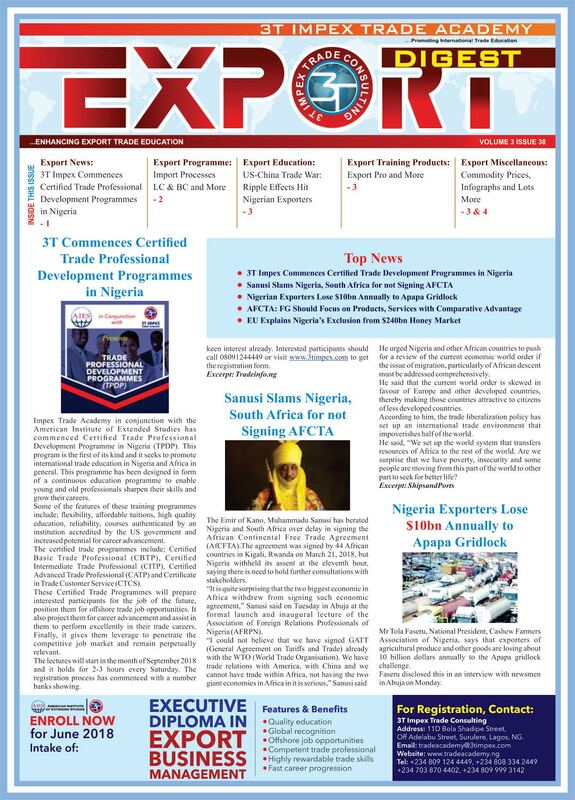 The certified trade programmes include; Certified Basic Trade Professional (CBTP), Certified Intermediate Trade Professional (CITP), Certified Advanced Trade Professional (CATP) and Certificate in Trade Customer Service (CTCS). 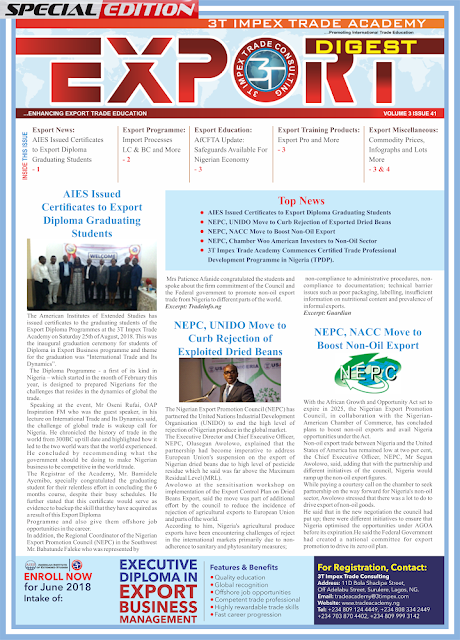 These Certified Trade Programmes will prepare interested participants for the job of the future, position them for offshore trade job opportunities. 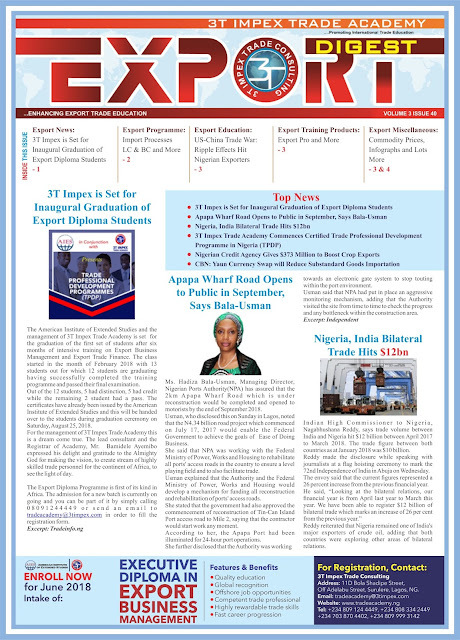 It also project them for career advancement and assist in them to perform excellently in their trade careers. Finally, it gives them leverage to penetrate the competitive job market and remain perpetually relevant. The lectures will start in the month of September 2018 and it holds for 2-3 hours every Saturday. The registration process has commenced with a number banks showing keen interest already. 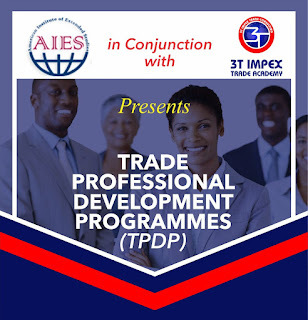 Interested participants should call 08091244449 or visit www.3timpex.com to get the registration form.